FANTASTIC episode this week, probably the best of the season so far! Barry and Ralph revisit the infamous bus looking for clues to help them find the last meta, Edwin. Armed with a dark matter scanner made by Cisco, they find an imprint of a body on one of the seats. Barry is also using the opportunity to teach Ralph the meaning of being a true hero, by not killing. Ralph isn’t getting it though. 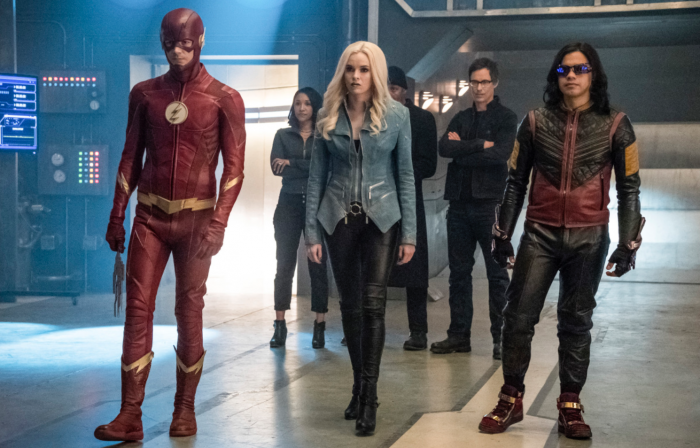 They finally track Edwin down and Barry, Cisco, Caitlin and Ralph head off to bring him back. When Edwin spots them though he disappears through a pocket dimension revealing his meta power. Let’s not forget that the thinking cap is very useful though, and Harry uses it to find Edwin’s different portal dimensions. They find him and bring him home. Ralph talks to him and discovers that Edwin has unknowingly used his portals to get into DeVoe’s layer before and asks him to take him there. Barry manages to stop them before they get anywhere. In some quite emotional scenes, Ralph reveals to Barry that he’s intent on sacrificing himself to protect his Flash family. Barry tries to make him see that he’s part of that family now and they don’t want to loose him either. I really noticed this episode how much Barry has changed by observing his interactions with the people around him. He’s matured and is not so different to his pal Oliver Queen in his ability to lead a team (well pre season 6 Oliver Queen!). Ralph’s efforts weren’t for nothing though and as a team they decide that it makes sense for them to use Edwin’s portal to get to DeVoe. Edwin sends Cisco, Caitlin and Barry off into yet another trap. DeVoe was expecting them and he’s used a portal into Star Labs. Iris comes face to face with Marlize again as they both fight each other defending the honour of their respective husbands while Joe takes on one of the samurais. Ralph is left to DeVoe who doesn’t delay in taking Edwin’s body and powers. Ralph uses the sceptre on him but shows some self restraint in not killing him. Barry and the others arrive back to find DeVoe in cuffs, cuffs which aren’t secured properly and as DeVoe finally takes over Ralph’s body his last thought is probably wishing that he killed him while he had the chance afterall. Devastating! I was devastated watching this happen. Stupidly, I’ve been confident that Ralph would survive all this and hoped that he would be a permanent addition to the team. Barry, Cisco and Caitlin all take turns in trying to stop DeVoe from disappearing again but he’s even more smug now that he’s inherited all of Ralph’s intel on them all. DeVoe’s path of destruction this episode doesn’t end with Ralph either. Caitlin discovers that he’s removed all the dark matter from her body meaning no more Killer Frost. After telling Iris about how the two have kind of built a weird sort of friendship with each other, Caitlin is clearly gutted. There was quite a lot to take in this week. So much happened but it was all so good. I’m going to miss Ralph so much as he’s another thing that has made this season so enjoyable to watch. It’s also a big shame that Caitlin has lost her meta ability. I’m just so excited to see what DeVoe has planned next!